We’re a group of alumni that LOVE Drexel Basketball. Love. Some of our best memories, best friends, significant others, and even a few pet names came through Drexel Basketball. We go back to games to catch up with old friends, grab a few beers, and cheer on the Dragons. It’ll be part of our lives whenever, and wherever we go. Still, we want more. We want the CAA championships. We want the beautiful new facilities. We want Drexel Basketball to be representative of how great the rest of Drexel University is. Unfortunately, none of us are billionaires, and we can’t do anything individually to make these “wants” a reality. Fortunately, we don’t have to. By coming together through the Blue and Gold Club, we can collectively make an impact. More alumni coming together around hoops means more investment from the President and Board of Trustees in basketball, which means better facilities, better recruits, NCAA tournament berths, and champagne bottles a-popping. And…the more members we have, the more benefits we can provide to said members. This year we had a limited number of free tickets available to any of our members that wanted them, as well as sweet parties for the annual Midnight Madness and Homecoming events. Next year, we plan on having even more exclusive benefits for our members. So how can you help? Right now it’s simple. 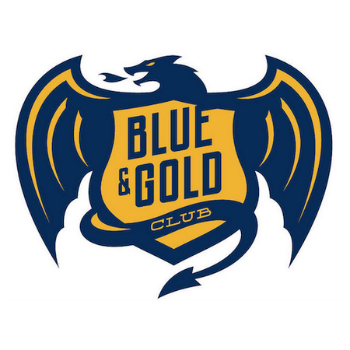 PLEASE TELL YOUR FRIENDS TO COME TO THIS PAGE AND SIGN UP FOR THE BLUE AND GOLD CLUB. IT’S FREE. WE DON’T SPAM. WE DON’T SCREAM IN CRAZY CAPITAL LETTERS. Whoops. Our goal is to increase membership by 500% by 2016, and we need everyone’s help to get there. The bulk of the Blue and Gold Club diehards can be found at men's and women's games in the first couple of rows left of the broadcasting booth. Come say hi and enjoy the game with us.